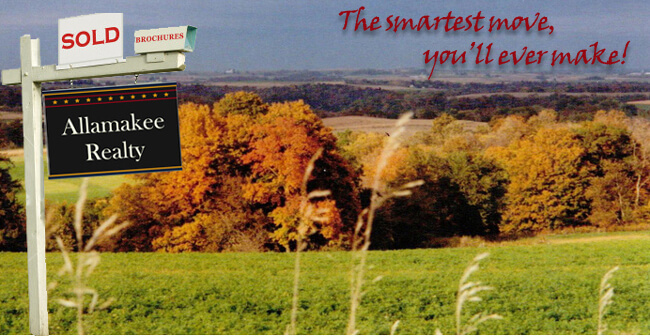 Let Allamakee Realty assist you! Located in northeast Iowa, we feel that our rivers, creeks, bluffs and fields are rich in beauty and history. Whether you want to boat on the Mississippi River, fish the Upper Iowa or the many creeks, hunt thousands of acres of public land, hike Yellow River Forest or sit on your front porch, this is the spot to be! Allamakee Realty is an established real estate firm that provides the knowledge needed to make your real estate move happen quickly and smoothly. Our staff is dedicated to providing excellent service to our clients. Professionalism, honesty, and being trustworthy are the basis of our agency. Our clients’ respect and happiness are important to us. Each listing, large or small, receives detailed attention and exposure. Allamakee Realty participates in the Northeast Iowa MLS, has listings on many websites, and offers additional exposure in the Tri-State Area Real Estate Guide and the local newspapers. If you are searching for a property, we can walk you through the buying process and will strive to find you a home that fits your needs, desires and pocketbook. Listing or buying, call Allamakee Realty and make this………..